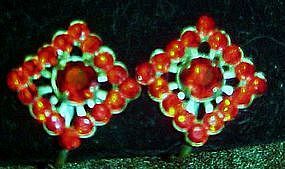 Pretty old vintage earrings are bright red shiny rhinestones. Diamond shape with large red center stone surrounded by smaller red rhinestones. Unsigned, clip backs. Good condition. Photo does not show the sparkle well.